Recently I met my cousin, who’s a graduate in IT, yet due to not-so-happening market, he hasn’t not able to get himself into a stable career & keep looking for new opportunities. Honestly, he’s just hung between the confusion whether he should continue the job or pursue higher studies. But, since we all know, even higher studies like MBA or any other course when not being done from a reputable institute, there are so fewer chances that you may get a placement. Why am I writing about such things at my blog, because I found an interesting and ideal programme for my cousin, which will not only boost his career growth, but will keep him focused on studies and give him a lifetime stable career which everyone wishes of, and the world needs to know about it too. This programme is MBA in Business Analytics, which has such a strong future ahead because of so many growing data company and start-ups coming up, there are an enormous number of vacancies coming up and are already there, comparatively available candidates to fill those vacancies are much less. But there’s more, keep reading for that.. The WNS-NU MBA in Business Analytics is a combined effort by WNS & NIIT University, offering potential candidates (especially those who are from IT, ITES or are business graduate) a two-year industry-integrated programme which is divided into eight terms of approximately 12 weeks each. This whole programme is designed by WNS in partnership with NIIT University (NU). This course, unlike conventional business management courses, offers a domain of Business Analytics with specialized knowledge and skill-sets in operations research, marketing, statistics, machine learning, data mining, computer sciences, etc. As I said previously, there is a shortage of skilled MBA’s who can deliver quick work productivity in the Analytics domain, which has created growth constraints for the sector, which is witnessing huge demands. And to fulfil such requirement in a faster pace, companies has to come up with solutions, which at current scenario is more beneficial for the candidates. That’s why, the structuring of the programme is designed in such a way, that the company shall finance the whole program, an upfront loan to pursue the programme, a stipend to sustain through it and after two years upon completion of course, an assured placement at WNS. This programme is like a once-in-a-lifetime opportunity to tap into the growing analytics programme, where a company is financing your complete course, giving you a stipend of Rs 10,000/month during the first year at NU campus and a stipend of Rs 50,000/month in the second year while working at WNS. 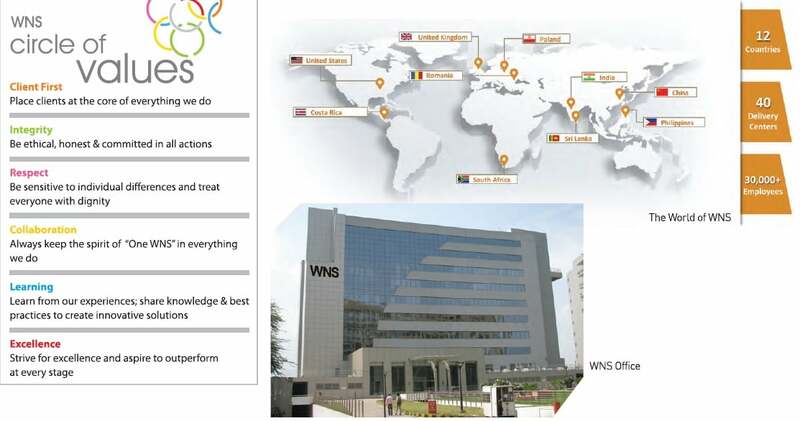 Upon completion of the programme, all candidates will get an assured placement at WNS at a mid-managerial position under WNS “Accelerated Career Development Programme” with an industry-leading compensation package. What else could one expect of? Why MBA in Business Analytics? Although I explained it above, yet I am sure, you must be wondering why to opt for this programme? While IT field is not promising a stable career in coming future, there’s a need to do specialised programme for those who are serious & ambitious about their career, ready to explore new opportunities, rather than doing the conventional courses. Even after getting commendable GPA, if you haven’t been able to get a job you’ve always wanted or that career growth you always hoped for, you better opt for this course for a long stable career. Keep reading to know more..
MBA in Business Analytics is a specialised programme which will help you understand the challenging domain of analytics and Big Data, as well as apply the concepts to real-world problems. Upon completion of the programme, you’ll have an expertise of various analytical tools and software’s’ which are being used all over in many industries for generating business intelligence, pertaining to different functional areas of an organisation. There is a huge demand for candidates in analytics domain, and the scarcity of candidates in the industry ensures lucrative salaries in the field. If you check job sites, you can find by yourself rising demands of Business Analytics professionals and the salaries being offered. During Hadoop Summit in 2014, it was predicted that digital universe is estimated to grow from 3.2 zettabytes to 40 zettabytes in only six years (one zettabyte is roughly a billion terabytes). That explains the rising demand for professionals in this field. As per an article in Forbes, within five years, there will be 50 billion smart connected devices in the world to collect, analyse and share data. At current scenario, only 0.5% data is ever analysed and used. Industries and big organisations are so much focused on trying and experimenting what is working and what’s not. Hence, to get a fair advantage over others, data analytics plays a significant role in differentiating between average and stupendous. Maximum number of jobs are available in India of analytics globally. As per McKinsey estimate, organisations in India would need more than two lakh data scientist in upcoming years. McKinsey also stated that the US will face a shortage of about 190,000 data scientists and 1.5 million managers and analysts who can understand and make decisions using Big Data by 2018. Because of the acute shortage of eligible candidates, Business analytics promises higher wages for good long years. Big Data pay big bucks for the right skill. Business analytics is growing as one of the prominent factors to drive more profitability and growth of any organisation. Hence, it’s a boom time for qualified business analytics professionals. Data is God and analytics is going to play a key competitive resource for many organisations. Foundation Module: This module would be of one-week duration and would be aimed equipping students with necessary fundamental knowledge and skills required for the subsequent terms of the programme, and familiarising them with the context and environment of Business Analytics. The learners will spend the first four terms on NU campus at Neemrana, followed by four terms off-campus (for Internships at WNS for programmes integrated with their work). Internships and projects are planned in consultation with the partner organization. Year 1: The intense first year of the programme consists of four on-campus terms with each term having seven programmes of three credits each. The programmes that will be taught include Core Management programmes, Communication & Professional Skills programmes, Business Analytics programmes, Data Science programmes and Business Application programmes. Year 2: Year two of the programme will have four supervised internships, one in each of the four terms, and industry-focused programmes that can be best learnt in the industry set-up. Internships will provide practical experience to the students in the field of Business Analytics to develop knowledge and skills by application of theory to actual problems in a non-classroom setting. Each internship term will have specified deliverables in the form of organisational work, special projects, assignments and presentations which have to be delivered within a specialised timeframe. The internship is actual work experience which will allow students to achieve personal goals aligned with the goals of the organisation where the internship is done. You can check more details on the official website here. Do share this information with others, as this needs to be known by all and I wish my good luck to the deserving students who may get enrolled here. I have crossed the age limit or would have loved to apply for same. Summary: The WNS-NU MBA in Business Analytics is a combined effort by WNS & NIIT University, offering potential candidates a two-year industry-integrated programme which is divided into eight terms of approximately 12 weeks each.